Hubballi: Before starting his second leg of campaigning in Mumbai-Karnataka region, BJP National President Amit Shah visited Siddharodamutt, a popular spiritual centre in the region, here on Thursday morning. Accompanied by State BJP President B S Yeddyurappa and other BJP leaders, Mr Shah was welcomed by women, with Poornakumbha and Arati. Mr Shah performed Pooja at the Gadduge of Sri Siddharooda Swamiji and Sri Gurunatharooda Swamiji. He was later felicitated by Sri Siddharoodaswamy Mutt Trust Committee office-bearers, at Kailas Mantap. Due the visit of the VVIP, devotees’ entry to Sri Siddharoodaswamy Samadhi Mandir was stopped for one hour. Mr Shah’s visit was scheduled at 9:40 am, and he came at 10:45 am. He was at Siddharoodamutt premises for 15 minutes. In addition to local police, Rapid Action Force (RAF) personnel were also deployed for the bundobust. Sri Siddharoodaswamy Mutt Trust Committee submitted a memorandum to Mr Shah, to take steps to name Hubballi Airport after Sri Siddharooda Swamiji. Mr Shah was also urged to arrange Rs 30 lakh funds for the construction of Prasada Nilaya and Rs 20 lakh for the construction of toilets and bathrooms at the mutt premises. Sri Siddharoodaswamy Mutt Trust Committee chairman D D Malagi, honorary secretary S I Kolakur, seers and others were present. Sri Paramarooda Swamiji of Seemikeri in Bagalkot district submitted a memorandum to Mr Shah, seeking BJP ticket to contest from Bilagi constituency. “I have already campaigned at 130 villages, and have forwarded application for BJP ticket, to the party’s State and national leaders. Earlier also, I worked for the victory of BJP candidate in the constituency,” he said. 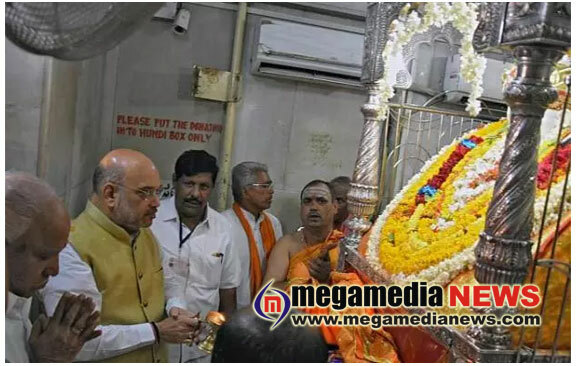 At Siddharoodamutt premises, a prominent spiritual centre where Om Namah Shivaya is chanted always, slogans in favour of Narendra Modi and BJP were raised by some persons, when BJP chief Amit Shah visited the mutt, and this irked several devotees. Sri Siddharoodaswamy Mutt Trust committee former trustee and BJP leader Ranga Baddi stated that the party had no role in his, admitting that somebody in the crowd raised slogans. Sri Siddharoodaswamy Mutt Trust Committee chairman D D Malagi opined that raising such slogans at the mutt premises was not correct.